Wildlife – Hurley Books – How do you do? Avoiding a meltdown at the end of August. There are times when I feel very sorry for my editor. Usually it’s because she has to try to sort out my novel use of punctuation or tackle my curious spelling alternatives but every once in while I will get a phone call from her that’s very friendly but also slightly strained asking where my article is? Today is one of those days. It’s not so much Stop the Press or Hold the Front Page but it’s quite close to Get a Bloody Move ON! I’m afraid I have no excuse other than sheer indulgence. Towards the end of August I start to get so fed up with the crowds, the children and the business that I become as frazzled and bad tempered as an autumn wasp and last week I reached my snapping point. You are probably all aware of that moment where people who like you start to talk to you in a careful manner and your partner tells you that you are unbearable. No? Oh, dear, just me then. Anyway I it was time for me to take a chill pill. This advice was proffered by my youngest and rather than kill him I decided to do just that. I’ve been out on two great dives out of Mevagissey. I love diving, it is so peaceful and so uncrowded, there is a whole new vista down there and you can become truly lost in your own contemplation of marine life. September is a lovely time to take up diving as the sea is warm and there is an abundance of plants and wildlife to look at. It’s also nice to do an activity with a bunch of different people to the usual crowd; divers are always really friendly and because you are literally relying on your diving partner to save your life should anything go wrong you all get chatting pretty quickly. As well as some great dives I decided to take Harry up to Minions and go for a really large, get lost type of walk. It was wonderful, I was out there for hours and saw hardly anyone, we discovered lots of new features that I had never seen before, ringed enclosures standing stone and so on, in fact Minions is rather littered with remains of archaeological significance, it almost seems as though it’s hogging stuff, there is so much. Harry and I traipsed from tor to tor thoroughly enjoying paddling through streams and rolling in the heather, I did more of the paddling and Harry did more of the rolling but from time to time we did swap duties. 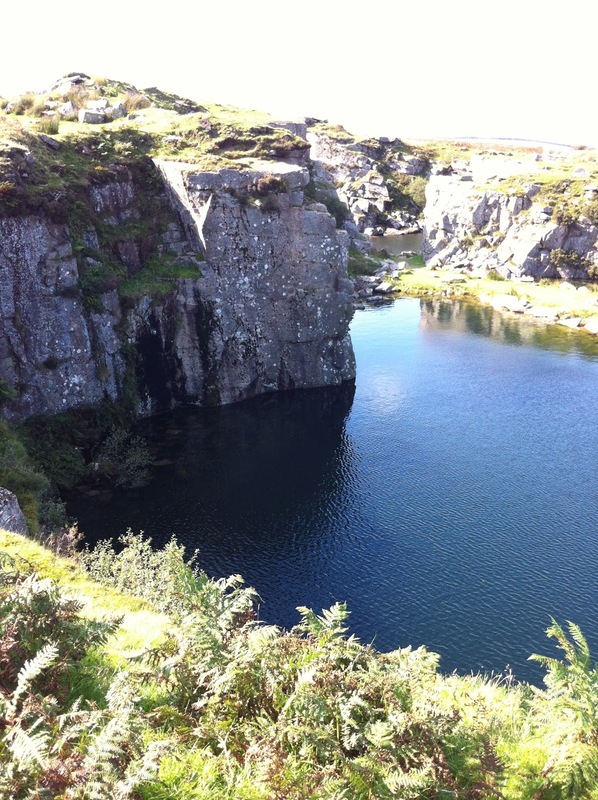 I even discovered a fabulous quarry, a place called Golddiggers near to the Cheesewring itself. In fact it is so close that I was a bit embarrassed that I had never found it before. It’s a wonderful location and as I sat beside it in the sunshine I watched a small shoal of fish also basking in the sunlight, with Harry popping in and out to refresh himself. It was very tempting to go for a swim but I didn’t have a cossie and I didn’t want to scare the group of teenagers that were also enjoying this little haven. Finally, I spent yesterday on the beach with about 8 other families, the children all grouped up and had a blast and all the mothers agreed that back to school couldn’t come soon enough. So there we are, no excuses but I am now fully rested and will start next week’s column tomorrow and save my poor editor any further grief. What a week! My column on my rotten veg patch clearly hit the right note with you lot. Janet said that I made her feel better that she hadn’t got around to doing her patch this season. Trevor pointed out that I shouldn’t expect anything more as I lived in St Austell; everyone knows Meva has the better soil and Gemma’s mother clearly took pity on me and dropped in a bunch of rather nice looking, and tasting, cucumbers! I often get feedback on my columns but a bag of veg is the best yet. Given my awful spelling I should be grateful that it wasn’t a bag of rotten tomatoes. I often get people telling me they read my column every week, they don’t say they like it, just that they read it – I’m guessing that this lot enjoy the grammatical howlers and schoolgirl spelling errors. I hope I manage to disappoint this week! Mevagissey played host this week to an Antarctic Island called Nowhereisland – it’s floating around Britain as some sort of art installation. Quite frankly it floated in and floated off to Falmouth and I’m still not much the wiser about what the point of it was. Part of it seemed to be interested in the melting of caps, other parts were about becoming a citizen of a new nation and what that nation should stand for. Dave, in his rather down to earth way, said that we should focus on getting our own nation right before fixing imaginary ones. 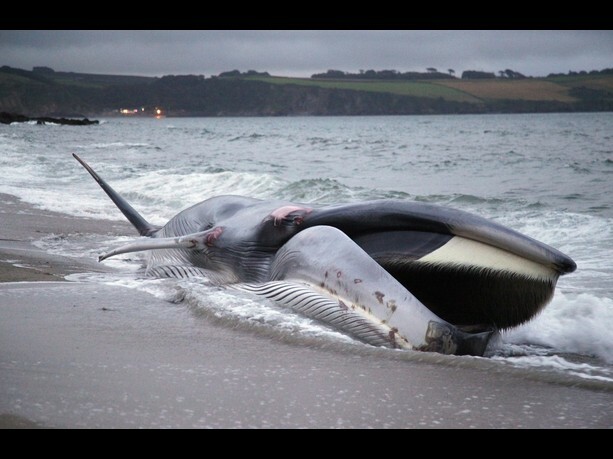 The thing that has really caught my attention this week though was the stranding of the 50ft Fin Whale on Carlyon Beach. There was a lot of criticism on Facebook of people posting photos but I thought that was completely understandable. If I had been able I would have gone down to have a look because quite frankly I’m curious and I don’t think there is anything wrong with curiosity. Where would mankind be without it? I should have loved to be able to see such an incredible animal up close. It was very sad that it died but it proved a salutary reminded of just what goes on in our seas out of sight and too often out of mind. Our seas are viewed as some sort of giant garbage dump but it is home to stunning leviathans, rare creatures, exotic, alien life forms even our weekly fish suppers. So please don’t dump your fishing tackle over the side for fish to drown in, keep your plastic lager ties in the bin as they get stuck on the noses of sharks and dolphins damaging their sensor systems. Don’t get involved in balloon races as turtles can’t tell the difference between jellyfish and plastic bags and balloons, they eat them and then die, autopsies showing stomachs full of plastic. Get involved, join a beach clean, take up diving and visit the wonders of the deep for yourself or just simply aim to eat fish once a week and make it something other than cod; any fishmonger worth their salt will be able to give you some quick recipes. Our oceans are stunning and we are hugely lucky to live so close to the sea, we just need to pay it a bit more attention.